With all the trade talk news inundating the media, it’s easy for investors to get caught up in the hype of investing in China. 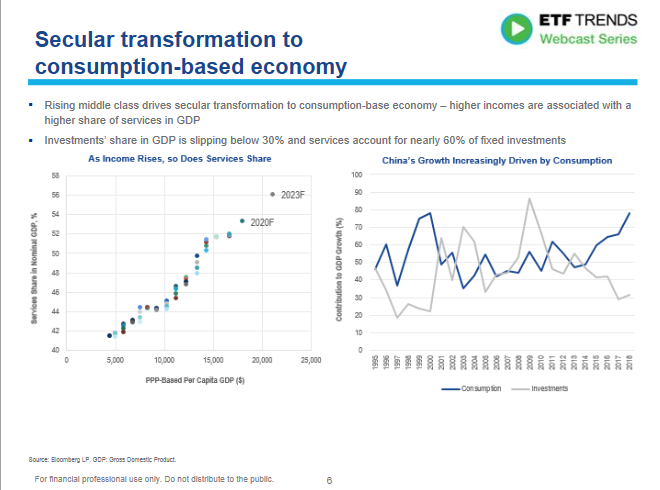 The last thing an investor should do is dive deep into China blindly–as such, Edward Lopez, Head of ETF Product at VanEck, and Natalia Gurushina, Economist, Emerging Markets Fixed Income, VanEck gave investors guidelines on how to invest in the world’s second largest economy during the Defining Your China Strategy for Today’s Market webcast. Of course, the primary trigger event is still a U.S.-China trade deal that’s at the tail end of negotiations. While some analysts feel a trade deal is already priced into the markets, investors are hoping it could continue to help sustain the strong start for U.S. equities. 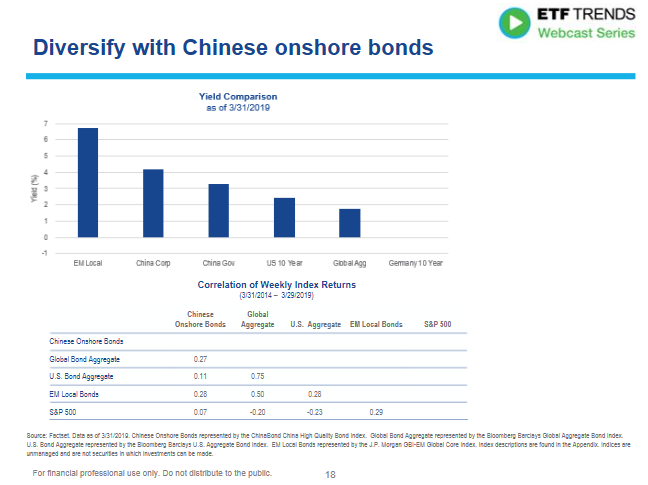 “Chinese equity markets this year are up significantly,” said Lopez. Markets have been voraciously feeding off trade deal optimism, especially now that a report surfaced that U.S. President Donald Trump will meet with Chinese president Xi Jinping soon at a trade summit. 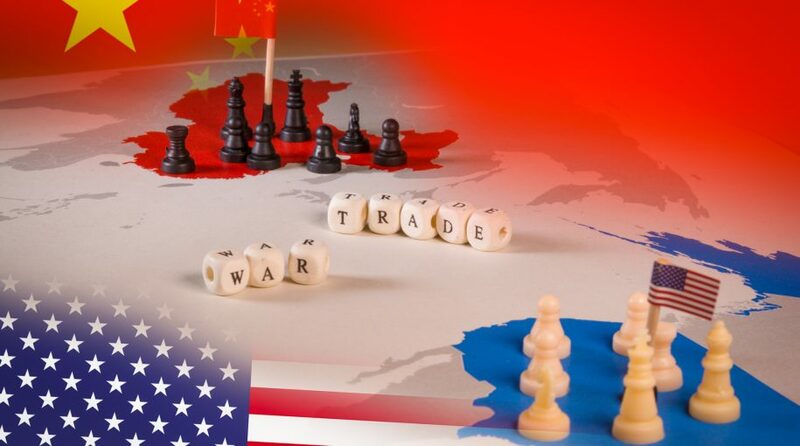 Trade negotiations between the U.S. and China have revolved around a wide range of issues, such as forced technology transfer as both are working feverishly to bring the trade war to an end. President Trump has already imposed tariffs to the tune of $250 billion of Chinese imports in 2018. Nonetheless, the overall market sentiment is that a trade deal will be beneficial to the capital markets. “If the deal is not particularly weak, the impact should be positive,” said Gurushina. With a population of over 1 billion, China’s experiencing its fair share of growing pains. As the size of its gross domestic product increases, so does the number of problems its economy faces, according to Gurushina. “China’s economy is getting quite sizeable,” confirmed Gurushina. Noticeable shifts in its economy include a move to a more consumer-based model. This has spurred a rise in the middle class, which will be China’s primary driver of growth moving forward. With expansive growth comes the need to borrow more money and with China becoming less restrictive in terms of foreign investment into its credit markets, that’s an area the country needs to fortify. Chinese bonds made their debut on the Bloomberg Barclays Global Aggregate Index recently–a move that would give investors more access to China’s $13 trillion bond market. Markets analysts are expecting that this inclusion would garner a capital influx of $150 billion in foreign inflows. “The main policy challenge right now is to strengthen the credit sector,” said Gurushina. Heading into 2019, cautionary investors were wondering whether China has gotten too big for its own good. Gurushina pointed out that the latest round of Chinese government stimulation has been bearing fruit. A mix of Chinese stimulus measures have been providing the fodder for economic growth, such as lower taxes, no corporate tax breaks, monetary policy adjustments, and more market access for foreign companies to set up shop. All in all, Wall Street is looking at the Chinese government’s latest efforts as a plus for its economy. 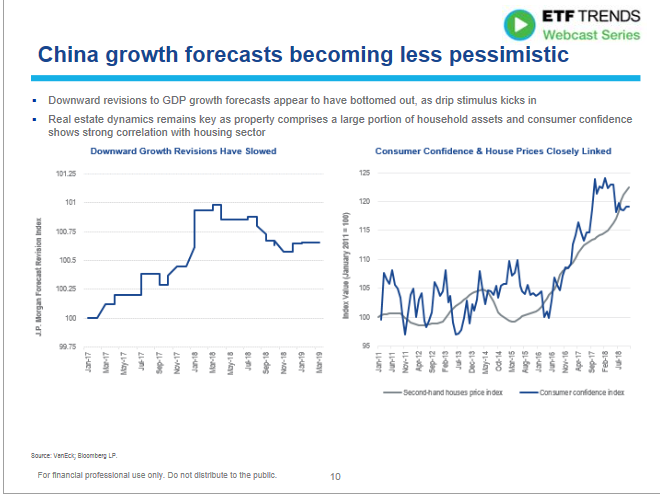 This should allay fears, and that a slowdown in China could be merely a quick breather before it continues its path to growth full steam ahead. China is becoming less resistant to safeguarding its businesses, which will open the pathways to more foreign investment. China equities have also been the beneficiaries of index provider MSCI Inc. announcing recently that it would quadruple its weighting of large-cap Chinese shares in its benchmark indexes. MSCI Inc. said it would increase the weight of China-A shares–China’s biggest and best equities–in the MSCI Indexes by increasing the inclusion factor from 5% to 20% in three steps. This has also been a net plus for investments in China equities. “This effort to bring China into these broad market indices brings them into the fold,” said Lopez. 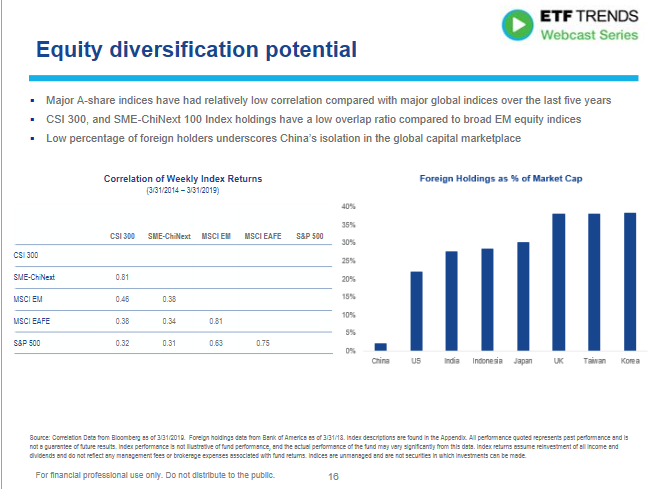 For investors, this opens up more opportunities to not only diversify their portfolios with China exposure, but to gain access to their best-performing equities. ETF investors can look to the VanEck Vectors ChinaAMC CSI 300 ETF (NYSEArca: PEK) and VanEck Vectors ChinaAMC SME-ChiNext ETF (NYSEArca: CNXT) to gain direct access to Chinese mainland markets. While PEK provides investors with large-cap exposure to Chinese markets, investors can opt for CNXT to gain small-cap exposure. CNXT seeks to mimic the performance of the SME-ChiNext 100 Index (CNI6109), which tracks the performance of the 100 largest and most liquid China A-share stocks listed and traded on the Small and Medium Enterprise Board and the ChiNext Board of the Shenzhen Stock Exchange. Lopez also suggested that investors give bonds a closer look as China looks to shore up its credit and lending. Furthermore, its gives the risk averse investor much-need access to China. “If you won’t want to take on the volatility of equities, you might want to consider a bond approach,” said Lopez. Lopez suggested investors give the VanEck Vectors China AMC China Bond ETF (NYSEArca: CBON) a look. CBON seeks to replicate the price and yield performance of the ChinaBond China High Quality Bond Index, which is comprised of fixed-rate, Renminbi-denominated bonds issued in China by Chinese credit, governmental and quasi-governmental issuers.